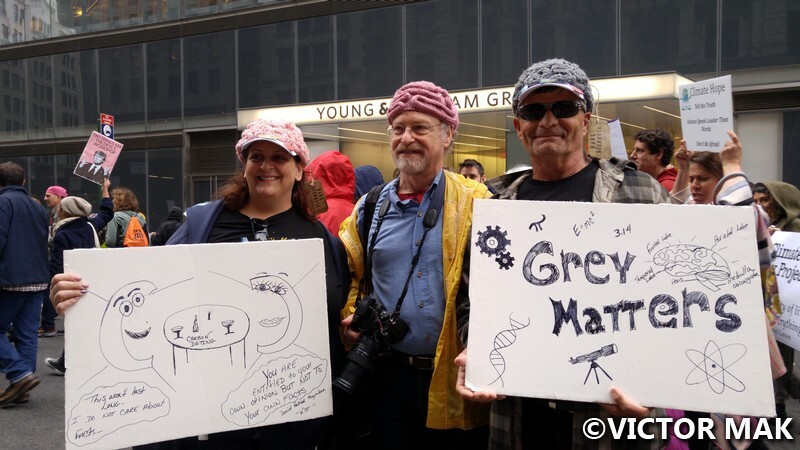 March for Science was a fun crowd, the signs were really creative. It’s estimated about 20,000 marchers came out. It was very well organized so it didn’t feel overcrowded. We didn’t get to take many pictures since we were holding up our signs. Holding up a sign for about two hours tires out the arms, they are still a little sore today. Victor was grinning, he was happy to be amongst tons of science enthusiasts. He originally was going to use a science board and say various things but changed his mind last minute and decided to make it look like a science project in school. A lot of people asked to take a picture of him, one lady posed and had her partner take a picture of them together with his sign. My sign was really Vic’s idea to. At Columbus Circle there was a black lady that said to me, “I needed to see that. I have to take a picture. Thank you for that.” She was really nice and I thanked her for taking a pic. It’s kind of funny, at every march and rally I’ve been to, we all ask to take pics of each others signs and thank each other. Someone made a sign with the twins from The Shining, that was great, they were too far ahead and it was raining so the pic didn’t come out. There were a few entry points to the march, we started at 72nd Street. As our group passed Trump International Hotel a guy by us said, “Let’s salute him with the New York State bird.” So we all raised our middle finger while chanting shame. Science is the way forward. Science is reality. It’s really ashame what’s happened to this country. Many of my friends think the US has hit it’s peak. It really seems like that. I’m hoping all this activist energy will change the tide for future generations but it’s going to be a long fight. It was great seeing parents take their kids to the march. They made really cute signs that we didn’t really take pictures of. We didn’t want to keep stopping in the crowd to snap pics. 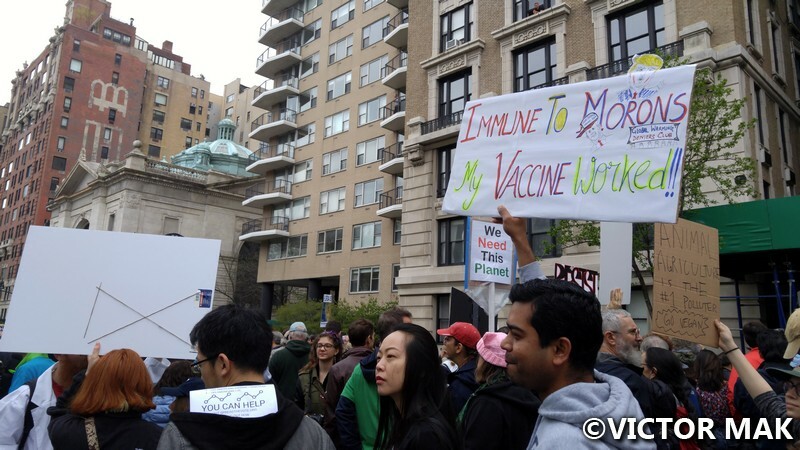 Scientists, parents, kids of all ages, students and science fans took to the streets to express how important science is to humanity. Love their hats. 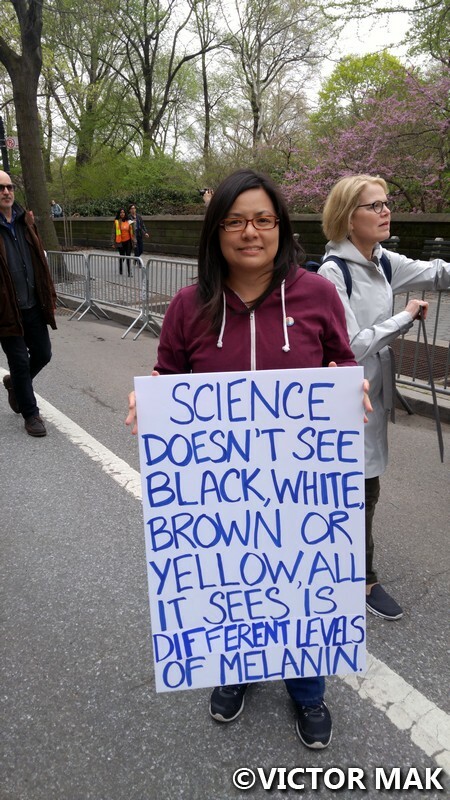 The brain was the March for Science pussyhat. I have to find one for Vic. 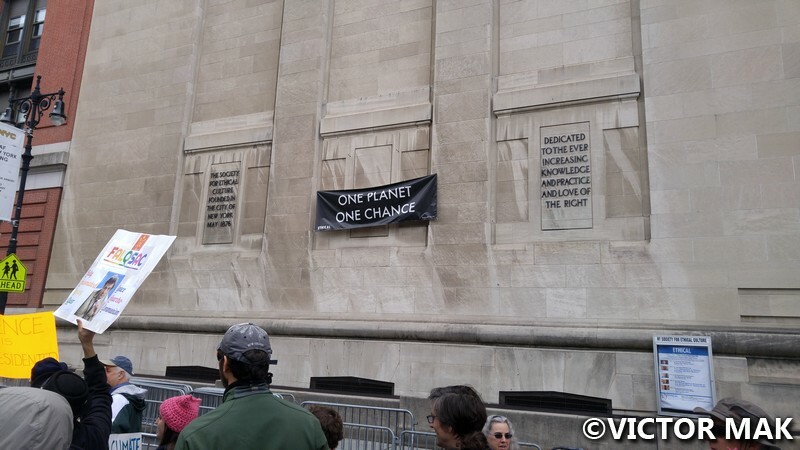 Posted on April 23, 2017 April 24, 2017 by jebusandandrea	This entry was posted in #lovetrumpshate, New York, North America, NYC, USA and tagged #lovetrumpshate, March For Science, March for Science NYC, New York City, NYC. Bookmark the permalink. I’m happy and proud that you and so many other people came for this march. 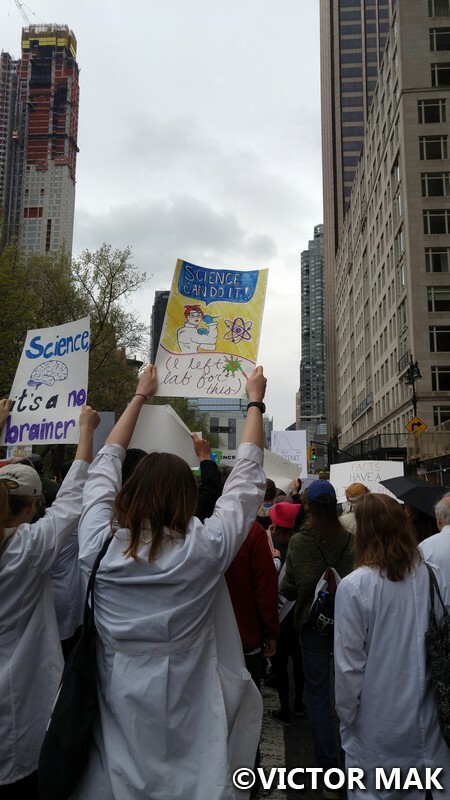 I didn’t go to our local march, but I was dismayed to hear on NPR that many scientists were afraid to express their views because their research was dependent on federal grants and programs. So it’s good to hear so many people showed up! You speak for those who can’t. I thought Vic’s sign was great! 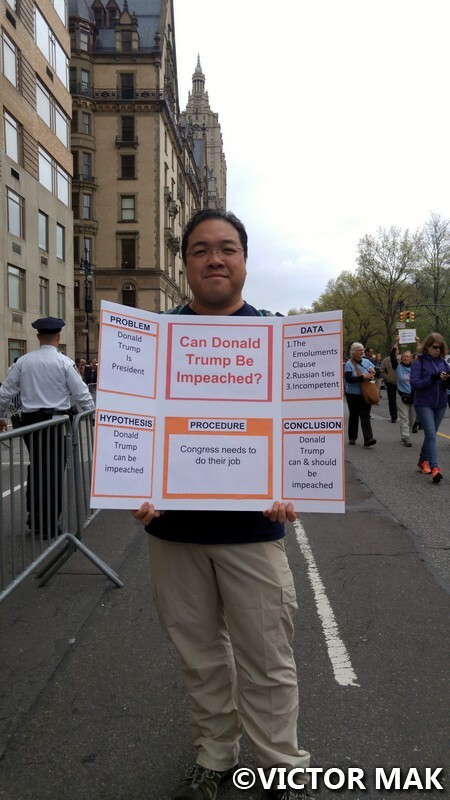 The science fair display is classic: I see so many of them every year, but I never would have thought of using one as a protest sign. I love yours as well; it addresses a subject I suspect a lot of people don’t associate with science. (Though maybe they will, now that the Henrietta Lacks film has come out on HBO.) Yay you! The idea hit him a few days before. It was great seeing little kids. Some had on costumes and That made the march for me. Now I have to work on my sign for the immigrants march in May. My sign is going to say something about my family being here before Trumps. It’s understandable how scientists are afraid, there is so much at stake now. There were plenty in the crowd in their lab coats. It was a fun crowd. A lot of people worse costumes. Thank you for marching for the cause! I do say Yes to Science too! !